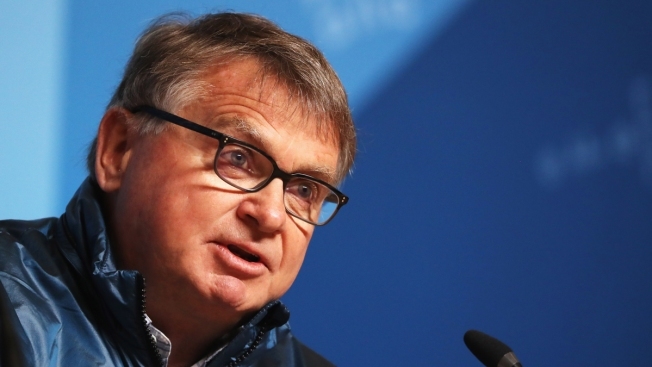 Alan Ashley of USOC addresses the media while attending a closing press conference for Team USA on day sixteen of the 2018 PyeongChang Winter Olympic Games on Feb. 25, 2018, in Pyeongchang-gun, South Korea. The U.S. Olympic Committee fired a top official Monday just hours after independent investigators revealed that he and the former CEO of the USOC knew for 14 months that team doctor Larry Nassar had been accused of molesting dozens of young girls — and failed to sound any alarms, NBC News reported. Chief of sport performance Alan Ashley was terminated because he and former CEO Scott Blackmun enabled a "wolf in sheep’s clothing" to molest and abuse dozens more girls under the guise of providing them medical treatment, the 233-page report by the law firm Ropes & Gray states. The former USOC officials Ashley and Blackmun could not be reached for comment.